You may not be aware of this because you haven’t made it past the HORDES of snowy-haired, sharp-elbowed M&S devotees at the swing doors, but Marks & Spencer currently has a good discount offer on. It’s 20% off, across menswear, homeware, selected furniture, knitwear (including cashmere), dresses, socks and tights. A couple of the premium ranges are excluded but effectively, a good chunk of the store is currently discounted. The discount is automatically applied at checkout, and applies both online and in many bricks-and-mortar M&S shops. Zig Zag Fit & Flare Spotted Tea Dress: reduced from £39.50 to £31.60. Also available in black. 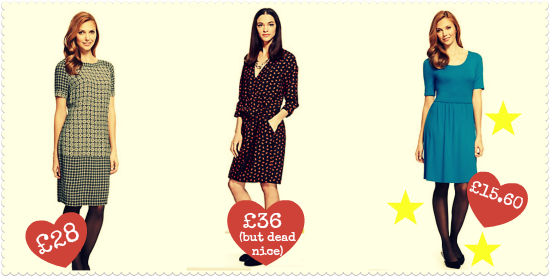 Spotted Fit & Flare Tea Dress (not pictured): reduced from £39.50 to £31.60. Again, you’ll need to click through to see the fabric, with its little white polka dots, at its best. Black shift dress: reduced from £35 to £28. Ruched shift dress with StayNEW: reduced from £29.50 to £23.60. This indigo number with the ruched tummy panel is the bestselling dress on the Marks & Spencer site. The StayNEW thing is supposed to help the fabric keep its colour and stay bobble-free for longer. Geometric Print Tunic Dress: reduced from £35 to £28. This isn’t a brocade dress: it’s a flat pattern, just busy. Lips print shift dress: reduced from £45 to £36. You’ll have to click through to take a proper look at this one: the lips print is great. Also, despite being relatively fitted for a shift, this dress is tremendously forgiving on mum tums around the waist. Skater Dress with StayNEW: reduced from £19.50 to £15.60. I’ll be honest: I am really pleased that Marks & Spencer does this skater dress, for such a low price. I really like skater dresses: they hang nicely, swing sweetly, can be bunged in the machine, rarely need ironing and are so comfortable. The problem is, most skater dresses have such teeny-weeny skirts. (I suppose that strictly, so do skaters – but you know what I mean.) This dress has a longer skirt and the M&S jersey fabric is really good: it’s soft and stays in good condition for years and years. This dress is turquoise, but also comes in black, red, pansy print and daisy print. I have the black one. It isn’t clear when the 20% discount offer ends: the website terms & conditions merely state that the closing date is “subject to uptake,” which isn’t hugely helpful. So get in while you can: partly because of this and partly because, in my local M&S at least, the nice stuff is flying off the shelves. Well speaking of discounts, I was going to add this to the Wine link at the bottom of this, but then saw it was 2008, so many would not see it. Co-Op currently have an un-advertised wine discount going on. I only discoverd this last week when I went into my local one to get another bottle of this FaBuLous red wine called ‘Chocolate Shop’. Oh boy, have I wanted to try this wine for Soooooo long, it-is-lush!!!! Well to my disappointment it was off the shelf as they were doing a Plan-o-gram change. So I went back the next day, no label on the shelf and it wasn’t in it’s usuall space ethier, buy still I picked up a bottle and brought it to the till. On closer inspection, after I’d paid, I realised all these previously expensive wines had been moved to one side and all were hugely reduced. Thanks for the great post! I always find cheaper priced work wear very tricky to find without compromising on the quality.